Since becoming consolidated in 1971, the Columbus, Georgia Consolidation Government has been committed to preserving the historical significance of our city. The Planning Department is responsible for establishing development guidelines to protect Columbus' historic architectural heritage. Ten neighborhoods in Columbus, Georgia have been designated as historic districts in recognition of their importance in the history and character of the city. These neighgborhoods are subject to the design guidelines approved by the Board of Historic & Architectural Review. The Board of Historic & Architectural Review(BHAR)shall encourage preservation, maintenance and improvements of buildings of historic and/or architectural significance within the Historic Districts. It has eleven appointed and voting members, four, which are appointed exclusively by the City Council. The other seven voting members are also appointed by the Council, but they must be members of and recommended by certain organizations as stated in the ordinance that established the board. There are three other nonvoting members, one of which is a representative of the Columbus Housing Authority, one of which represents the Planning Department and the other represents the Columbus Inspections and Code Enforcement Division. The Board of Historic & Architectural Review (BHAR) supports and furtherance of its findings and determination that the historical, cultural and aesthetic heritage of the City of Columbus is among its most valued and important assets. The preservation of this heritage is essential to the promotion of the health, prosperity and general welfare of the people. To stimulate revitalization of the business districts and historic neighborhoods and to protect and enhance local historical and aesthetic attractions to tourists and thereby promote and stimulate business. To enhance the opportunities for federal and/or state tax benefits under relevant provisions of federal or state law. To provide for the designation, protection, preservation and rehabilitation of historic properties and historic districts and to participate in federal or state programs to do the same. * Applications must be submitted to the Planning Division of the Columbus Consolidated Government before 5:00 p.m. of the deadline date along with all applicable requirements. No incomplete applications will be accepted after the Application Deadline. If you have questions concerning the completeness of your application please contact Trey Wilkinson, City Planner at (706) 225-3928. We will be happy to review any applications for completeness prior to the Application Deadline. The applicant or their appointed representative must be present at the Board of Historic and Architectural Review meeting. The case will not be heard without a representative present. BHAR meetings are held in the ground floor Conference Room at the Government Center ANNEX, located at 420 10th Street. ** Please Note: April and May meetings have been moved to the Ground Floor Conference Room at the Government Center Tower due to renovations at the Annex. A Certificate of Appropriateness is required for any change in materials or appearance to the exterior of a designated historic property prior to beginning construction. Common alterations that must be approved include but are not limited to: addition of fences, construction of decks, porches and ramps, and demolition of any structure in the historic districts. Additional information is available by clicking the "Design Guidelines" link below. To begin the review process, first download and fill out a Certificate of Appropriateness application. To download an application, click the "Review Application" below. Once completed, the application and all supporting documents must be received by the Planning Department no later than 5:00 PM on the applicable application deadline date. Check application deadlines and meeting dates below. The applicant or their appointed representative must be present at the Board of Historic and Architectural Review meeting. The case will not be heard without a representative present. If your case has been approved by the Board, the Certificate of Approval can be picked up from the Planning Department on the Monday following the meeting. Application fees for demolitions, new constructions, additions or modifications of existing constructions in any of the Historic Districts. *Applications must be submitted to the Planning Division of the Columbus Consolidated Government before 5:00 p.m. of the deadline date along with all applicable requirements. No incomplete applications will be accepted after the Application Deadline. If you have questions concerning the completeness of your application please contact Lynda Temples, Transportation Planner at (706) 653-4116. We will be happy to review any applications for completeness prior to the Application Deadline. **Meetings will be held on date shown if closed on oiginal date (2nd Monday of the Month) due to city holiday. A couple of historical documents such as the Nolan City Plan of 1926 and the Street and Highway Plan for Columbus and Phenix City of 1947 have been found that show important transportation and urban planning data for the Columbus area. The Columbus City Plan was writen by City Planner, John Nolen, in 1926 and presented by the Planning Board as the Comprehensive Plan for the City of Columbus, Georgia. This report is based upon an intensive study of the existing conditions and our future requirements so that the two might be correlated to secure the orderly development of our community. This study has covered a period of two years and has been made by every municipal agency under the guidance of John Nolen, one of the foremost experts in City Planning. The Street and Highway Plan for Columbus, Ga and Phenix city, Al was prepared by the H.W. Lochner & Company and prepared for the State Highway Department of Georgia. In the development of 'this plan the basic data utilized was obtained by the State Highway Department of Georgia and the State of Alabama Highway Department through'an Origin-Destination traffic survey. This information was utilized in connection with an analysis of the capacity and adequacy of existing streets and highways, resulting in the program of needed improvement projects. While the plan is primarily concerned with the State and Federal highways, it also includes numerous improvements needed on the City and County street and highway systems. "To lay out a Trading Town, and to dispose of all the Lands reserved for the use of the State near the Coweta Falls"
Wikipedia: Sanborn Maps is an American publisher of historical and current maps of US cities and towns. The maps were initially created to estimate Fire Insurance risks. The company's maps are frequently used for historical research and for preservation and restoration efforts. 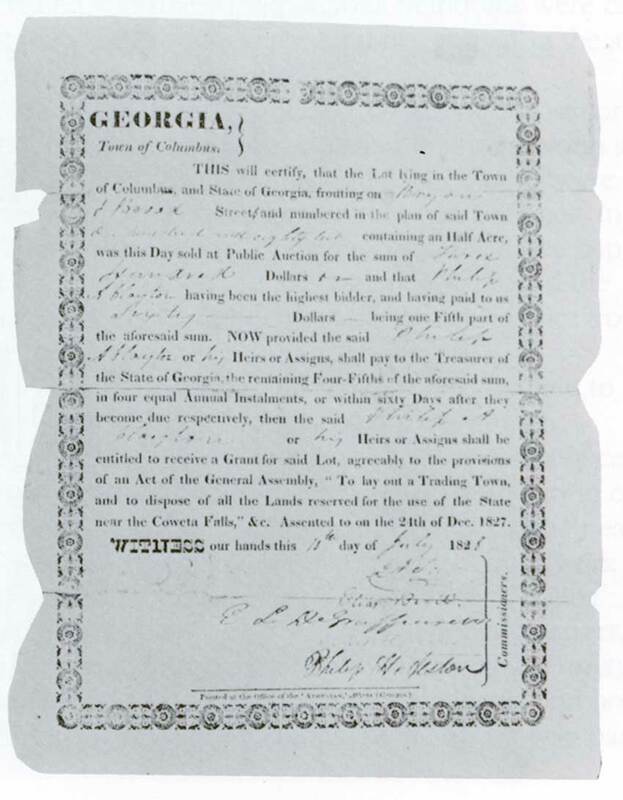 On Feb. 12, 1825, a group of Creek Indians led by William McIntosh signed the Treaty of Indian Springs, in which they ceded all of their remaining lands in present-day Georgia. Subsequently, in an act of June 9, 1825, the General Assembly provided that the land ceded by the treaty be divided into five sections, surveyed into districts and land lots, and distributed by land lottery.